A member of the National Symphony Orchestra since 2000, a versatile and expressive performer, Natasha Bogachek has presented numerous solo and chamber music concerts and master classes throughout the U.S. and South America. Ms. Bogachek has recorded for the Vernissage Records label and performed frequently on public radio. In addition to her orchestral responsibilities, Ms. Bogachek maintains a busy concert schedule, appearing with orchestras and in recital and chamber music performances in the Greater Washington D.C. area, including Millennium Stage and Terrace Theaters of the Kennedy Center, Howard Theater, The Lyceum, Mount Vernon Estate and Embassy Series among other venues. Bogachek’s solo engagements include performances in the former Soviet Union, former Yugoslavia, France and Finland with orchestras such as the Sverdlovsk Philharmonic and Sibelius Academy Symphony Orchestra among others. While in the United States, she has appeared as a soloist with the National Symphony, Knoxville Symphony, Centennial Philharmonic, Virginia Chamber and Eclipse Chamber Orchestras, and performed with various chamber music groups, including Kennedy Center Chamber Players. 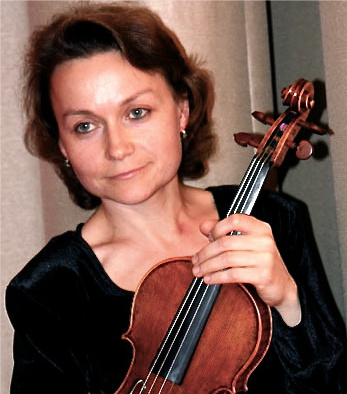 Since 1997 Ms. Bogachek performs extensively with her husband Zino as a violin duo. Praised for their homogeneity and style, Duo Concertone has presented critically acclaimed programs of works taken from three centuries of music throughout the U.S.